Bigfoot News | Bigfoot Lunch Club: The Voice of Russia: Tea party with the Yeti? At the Russian news source, The Voice of Russia, Alexei Chernichenko reports a new enthusiasm for the Yeti. Capitalizing on Yeti Day November 11, locals continue to capitalize the enthusiasm for the the cryptid by offering to host a tea party and a custom-made furnished chill-out room. Read the rest below, including an endorsement from Igor Burtsev. 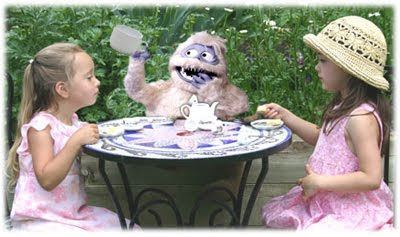 Tea party with the Yeti? KUZBASS, Feb 6, 2011 (The Voice of Russia) -- Enthusiasts in the Russian Siberian region of Kuzbass continue to search the region’s remote areas for the Yeti in a drive that was earlier endorsed by Kuzbass Governor Aman Tuleyev. He jokingly announced the payment of one million rubles to a person who he said will be able to bring the ape-like cryptid to the governor’s residence so that the three could have a tea together. The announcement came in the wake of the establishment of the Yeti Day in Kuzbass. The Yeti boom kicked off in Kuzbass in 2010 after unverified information about the Yeti allegedly being spotted by local hunters in taiga near the Gornaya Shoriya Mountains. The news immediately hit the headlines, with readers especially amazed with the photograph of the Yeti’s alleged footprint. Experts remained downbeat about the news, which was understandably hailed by PR agencies and tour operators. A number of monuments to the Yeti has been installed across Kuzbass since then, and Russia’s special presidential envoy to Siberia traveled to a cave where the Yeti was ostentatiously tracked down. No traces of the Yeti were discovered at the time. Even so, many in Kuzbass still hope against hope that Aman Tuleyev will be lucky to finally see the Yeti coming to his place for a tea party. Echoing them is Igor Burtsev, a Moscow-based Yeti expert, who argues that that the information about Yeti is first of all music to businessmen’s ears. "As I see it, Kuzbass business people are almost sure to benefit from this," Burtsev says, referring to the Yeti ballyhoo in the United States, where businessmen do not think twice before capitalizing on the matter. "Dozens of corresponding cafes, restaurants and museums annually open their doors there," Burtsev goes on to say, also citing a host of scientific conferences and open-air concerts to this effect. "Jokes aside, I do believe that the Yeti really exists, and keeping in touch with him remains my top priority," Burtsev says. He piled praise on Aman Tuleyev’s announcement of a possible tea party with the Yeti, which Burtsev said is a right way to try to lure the cryptid into meeting human beings. In the meantime, mass production of souvenir birch bark bugles has started in Kuzbass. Tour operators insist that these bugles’ sounds allegedly attract the Yeti….